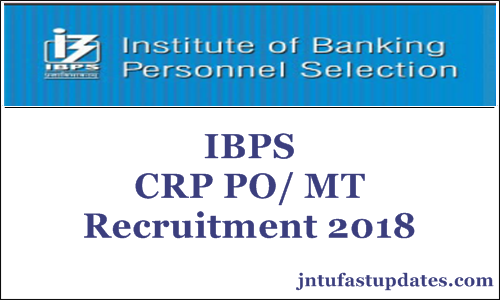 IBPS CRP PO/ MT Recruitment 2018: Institute Of Banking Personnel Selection has released Common Recruitment Process For Recruitment Of Probationary Officers/ Management Trainees In Participating Organisations (CRP PO/MT-VIII For Vacancies Of 2019-20). The online examination (Preliminary and Main) for the next Common Recruitment Process for selection of personnel for Probationary Officer/ Management Trainee posts in the Participating Organisations is tentatively scheduled in October / November 2018. Candidates, intending to apply for CRP-PO/MT-VIII should ensure that they fulfil the minimum eligibility criteria specified by IBPS in this advertisement or Notification. i. Rs. 100/- for SC/ST/PWD candidates. Candidates are first required to go to the IBPS’s website www.ibps.in and click on the Home Page to open the link “CRP PO/MT” and then click on the option “CLICK HERE TO APPLY ONLINE FOR CRPPROBATIONARY OFFICERS/ MANAGEMENT TRAINEES (CRP-PO/MT-VIII)” to open the On-Line Application Form. After that a provisional registration number and password will be generated by the system and displayed on the screen. Candidates can apply online only from 14.08.2018 to 04.09.2018 and no other mode of application will be accepted. Pre-Requisites for Applying Online.